Das Buch History of Aerosol Science enthält die ausgearbeiteten Vorträge (39 Beiträge von Autoren aus 16 Ländern) des gleichnamigen internationalen Symposiums,welches von der Kommission für Reinhaltung der Luft der Österreichischen Akademie der Wissenschaften in Wien vom 31.August bis 2.September 1999 veranstaltet wurde.Unter Aerosolen versteht man in der Wissenschaft die Suspension von festen und/oder flüssigen Teilchen in Gasen, z.B.Rauch, Dunst, Staub, Wolken usw. 3) Aufbau nationaler Vereinigungen von Aerosolwissenschaftlern während der letzten dreißig Jahre. 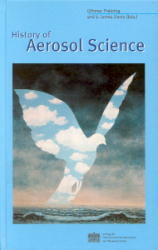 The book History of Aerosol Science contains the proceedings of an international meeting held in Vienna from August 31 through September 2,1999, organized by the Clean Air Commission of the Austrian Academy of Sciences.The term aerosol means solid and /or liquid particles suspended in gases e.g.smoke,haze,dust,clouds etc. Aerosol science can be traced back to ancient times when man started to use fire.The inhaled smoke and soot produced causes health hazards.The word aerosol was first coined after World War I,and it has been generally used since the middle of the 1960s. Aerosol science,which interested only a few scientists 50 years ago,is now a fast-progressing field. Today thousands of scientists are working in this field all over the world. 3)Formation of national associations of aerosol scientists during the last 30 years.